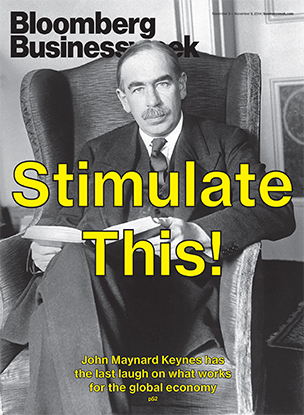 When he coined the famous “…slave to some defunct economist”, Keynes was thinking of himself! With fiscal policy missing in action, the world’s biggest central banks tried heroically(!) to plug the gap. The U.S. Federal Reserve cut interest rates to near zero, and when even that failed it tried some new tricks: buying bonds to bring down long-term interest rates (“quantitative easing”) and signaling the market that rates would stay low even after the economy was on the path to recovery (“forward guidance”). The limited effectiveness of those measures is sometimes chalked up as a failure of Keynesianism, but it’s just the opposite. Keynes was the economist who demonstrated that monetary policy ceases to be effective once interest rates hit zero and whose recommended policy in those circumstances was tax cuts and spending hikes. The intellectual response to the Great Depression is often portrayed as a battle between the ideas of Friedrich Hayek and John Maynard Keynes. Yet both the Austrian and the Keynesian interpretations of the Depression were incomplete. Austrians could explain how a country might get into a depression (bust following an investment boom) but not how to get out of one (liquidation). Keynesians could explain how a country might get out of a depression (government spending on public works) but not how it got into one (animal spirits). 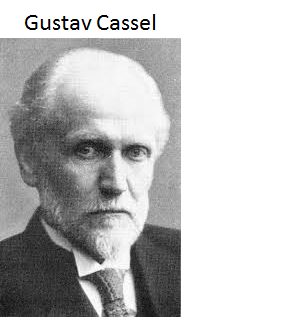 By contrast, the monetary approach of economists such as Gustav Cassel has been ignored. As early as 1920, Cassel warned that mismanagement of the gold standard could lead to a severe depression. Cassel not only explained how this could occur, but his explanation anticipates the way that scholars today describe how the Great Depression actually occurred. Unlike Keynes or Hayek, Cassel explained both how a country could get into a depression (deflation due to tight monetary policies) and how it could get out of one (monetary expansion). But our finding that there is substantial variation in outcomes suggests different questions. Are there policies that can be undertaken in normal times not just to reduce the chances of crises, but to make their consequences less grave if they occur? What policy actions when a crisis occurs—in addition to steps to lessen the crisis and resolve it quickly—could minimize its effects? The answers to these questions are important for ensuring not just that each time is different, but that none is terrible. To those questions she has already sketched an answer. SF Fed Williams “discovers” the “powder less gun”! Federal Reserve Bank of San Francisco President John Williams said on Friday that central banks’ largely successful pursuit of low inflation could mean they more frequently run into periods where monetary policy hits levels of interest rates that can’t be cut further. Price-level targeting also has potential positive attributes related to financial stability. Because debt contracts are typically written in nominal terms, a period of unexpectedly low inflation or even deflation causes the real value of debt to rise relative to expectations when the contract was signed. This can contribute to weakening of households’, businesses’, and banks’ balance sheets, resulting in a decline in economic activity and greater stress in the financial system. Under inflation targeting, the increase in the real value of debt is not reversed. In contrast, if the central bank acts to keep overall prices on a steady growth path, then episodes of excessively low inflation or deflation are eventually reversed, mitigating this type of debt deflation problem and the deadweight losses and disruptive effects associated with foreclosure and bankruptcy. In this way, price-level targeting has the potential to reduce the risks to the financial system and spillovers to the economy from debt-fueled booms. Nominal income targeting takes these arguments a step further. Instead of a price path that sets the goal for policy, it’s a path for nominal GDP. In terms of the ZLB, nominal GDP targeting shares the advantage of price-level targeting: Specifically, it promises higher inflation in the future following a period of low inflation that helps dampen deflationary pressures. On the financial stability front, it may be an even more powerful deterrent to debt-fueled crashes. If aggregate nominal income is kept close to a steady growth path, then on the aggregate, incomes won’t fall as much during a downturn, allowing people to continue to repay their loans and avoid default and bankruptcy (Koenig 2013 and Sheedy 2014). These potential benefits of price-level and nominal income targeting are worthy of further careful study and discussion. 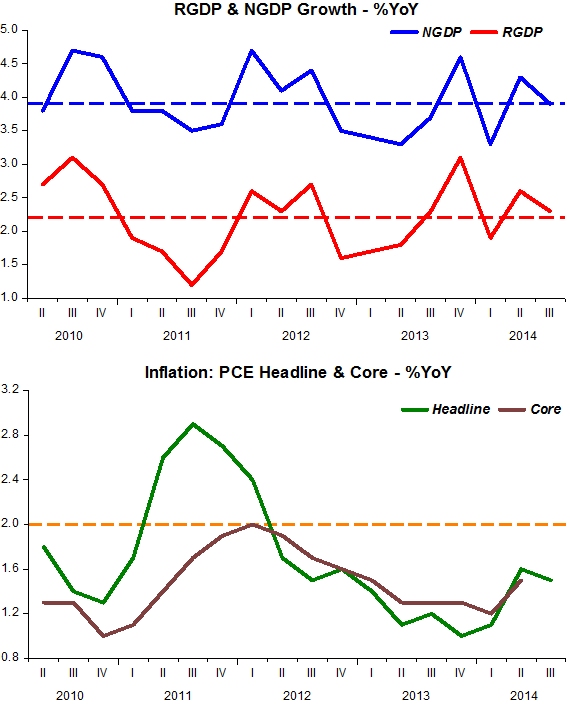 It is too early to judge whether one approach or the other would provide a better framework than inflation targeting. In contemplating a shift away from inflation targeting, it is crucial to consider what unintended negative consequences these approaches might entail. For example, nominal income targeting could generate persistent deviations of inflation from target, which may interfere with the credible communication of the price stability objective. There are also practical considerations in the communication of policy decisions and goals that need to be fully analyzed. In weighing all the potential advantages, disadvantages, and risks of these and other alternative approaches, it is absolutely essential that any modification of approach not undermine the hard-fought achievement of price stability and well-anchored inflation expectations that have been of great benefit, especially during the recent challenging economic times. The highlighted sentence shows his confusion. If you have a NGDP level target you do not, simultaneously have an inflation (“price stability”) target. Successful NGDP level targeting implies nominal stability, and that creates the conditions for both price and real output stability, exactly the outcome during the 20 years of “Great Moderation”. As a bonus, you avoid getting stuck with “powder less guns”! What the heck is Yellen talking about? “Views” or “Gender”? Janet Yellen, the first woman to lead the Federal Reserve in its 100-year history, said Thursday the economics profession, which is dominated by white males, could benefit from a more diverse range of views. “Often, in the things economists study and the methods we use, diversity is a good thing,” Federal Reserve Chairman Janet Yellen said. “Did the economics profession recruit and promote the individuals best able to bring the energy, the fresh insights, and the renewal that every field and every body of knowledge needs to remain healthy?” asked Ms. Yellen, who was delivering introductory remarks at a conference on diversity in the economics profession. I vote for Christy Romer. She satisfies both the “views” and “gender” requirements. The U.S. economy expanded at a healthy pace during the third quarter, a sign of sustained growth fueled by government spending and a narrower trade deficit despite mounting concerns about the health of overseas economies. First, when you follow annual rates the feeling is you´re on a roll coaster. Lots of “ups and downs”. That´s always been true, even during the “Great Moderation”. Over the last four years, after recovering from a “stroke”, measured on a year over year basis the economy´s “EKG” shows signs of high stability. But if you take the economy´s “pressure” it will come up “low”. And in this kind of situation some “signs” – like unemployment – give out misleading information, confusing the “medical board”. Some say the economy will never be able to run at “previous speeds” and at higher levels, having been “secularly stagnated”! If oil prices rise (like in 2007-08) there´s a risk of permanently lifting inflation; but if oil prices fall, the effect on (dis)inflation is only temporary! 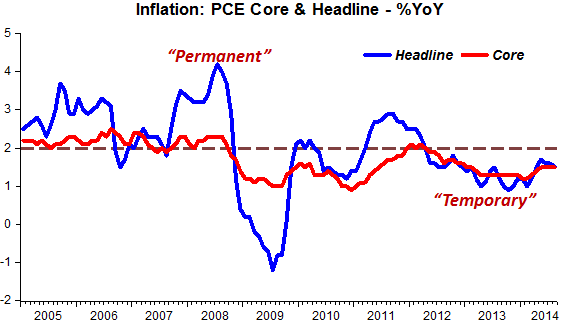 As I anticipated, the Fed dismissed the decline in market-based inflation expectations. They clearly believe financial markets over-reacted to the decline in oil prices, and that that decline would ultimately prove to be a one-time price shock rather than the beginning of a sustained disinflationary process. If only symmetry held, the “Great Recession” would have been only “Recession”! And as a bonus we would not have been listening, insufferably, to “Great Stagnation” talk. 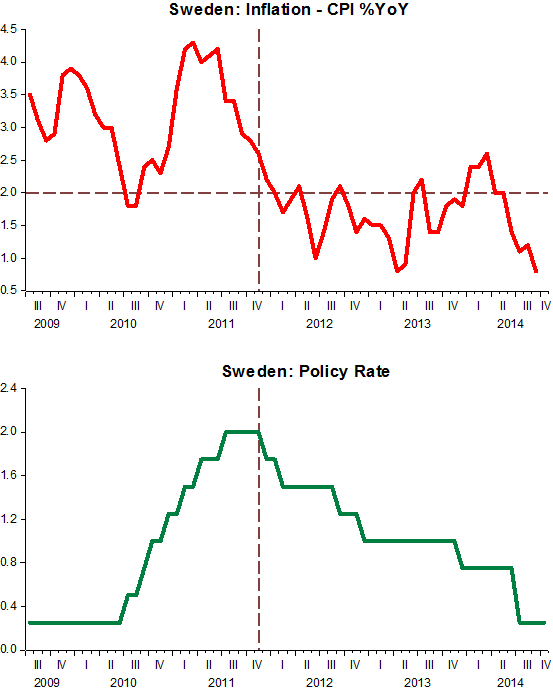 The Swedish central bank just lowered interest rates to zero because of deflation risks. This action comes after ignoring repeated warnings from Lars Svensson who had joined the bank in 2007 and later resigned because of disagreements with monetary policy decisions. What it is interesting is the parallel between Riksbank decisions and ECB decisions. In both cases, these central banks went through a period of optimism(!) that make them raise interest rates to deal with inflationary pressures. In the case of Sweden interest rates were raised from almost zero to 2% in 2012. In the case of the ECB interest rates were raised from 1% to 1.5% during 2011. Also, in both cases, after a significant expansion in their balance sheets following the 2008 crisis, there was a sharp reduction in the years that followed. During 2010 the balance sheet of the Riksbank was reduced by more than 50%. In the case of the ECB it was later in 2013 when the balance sheet shrank by about 1 Trillion Euros. Their policies stand in contrast with those of the US Federal Reserve and the Bank of England where interest rates still have to start going up after the initial actions taken during the crisis and where the expansion in their balance sheet has not started to being reversed. 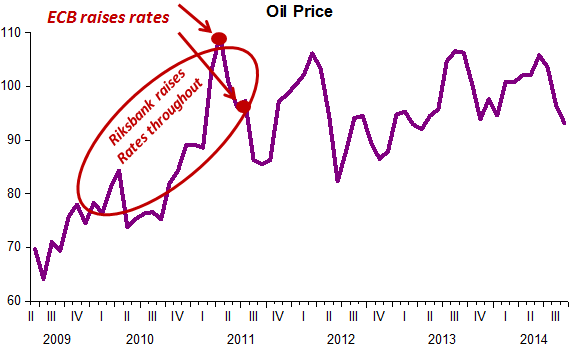 The Riksbank increased rates from “almost zero” (0.25%) in mid-2009 to 2% in mid-2011. That is it increased rates much faster than Fatas thinks! It seems that throughout this period they were extremely worried about inflation. But the headline numbers were mostly reflecting oil price increases, a supply shock, something that throws sand in the gears of inflation targeting! After a two day meeting you can wonder why it took 48 hours to…do nothing! The Federal Reserve on Wednesday said it would stop its long-running bond purchase program at the end of October, ending a historic experiment that has stirred intense debate about its effects in markets even though the central bank said it accomplished(!) its main goal of reducing unemployment. Let´s see what Quarter 3 GDP (both R & N) looks like tomorrow. The Federal Reserve’s forward guidance has been a lot more effective at keeping long-term rates down and stimulating the economy than its three bond-buying programs, says Eric Swanson, an economist at the University of California, Irvine, who until recently was a researcher at the San Francisco Fed. Such low-rate promises, says Mr. Swanson, who co-authored an influential paper on unconventional Fed policy with San Francisco Fed President John Williams early last year, have had a perceptible downward effect on borrowing costs. “The cumulative effect of the Fed’s forward guidance has surely been much more important than the effect of its long-term bond purchases,” Mr. Swanson said in an email in response to questions from The Wall Street Journal. He estimates the Fed achieved only a fairly modest 0.1 to 0.2 percentage point decrease in short-term rates from its second round of bond buys, which amounted to $600 billion. “I think, going forward, the [Fed’s policy committee] views forward guidance as the better policy tool, which is why it’s comfortable winding down its long-term bond purchases now,” said Mr. Swanson, who was a senior research advisor at the San Francisco Fed and was previously a staffer at the Fed’s Washington-based board. Forward Guidance is in effect telling everyone that the Fed expects the economy to remain in dire straits “forever”! No wonder “borrowing costs” (a.k.a. interest rates) are kept down; and that doesn´t mean it is “stimulating” the economy. Quite the contrary! The Riksbank cut the deposit rate to -0.75pc in what looks like a preparatory move to drive down the krona. Governor Stefan Ingves said the bank has a toolkit of extreme measures in reserve, including use of the exchange rate. If the Riksbank was caught off guard, it’s because they weren’t paying attention to the only world class monetary expert on their committee. The Riksbank has in effect washed its hands of the credit boom, leaving it to government regulators to control household debt with mortgage curbs, liquidity limits for banks and other “macro-prudential” tools as best they can. The Executive Board of the Riksbank has decided to raise the repo rate to 4.75 per cent. The assessment is that the repo rate will remain at this level for the rest of the year… It is necessary to raise the repo rate now toprevent the increases in energy and food prices from spreading to other areas [oil and commodity prices had peaked 3 months earlier]. Inflation targeter Lars Svensson was in favor. But he later recanted and was all for more expansionary monetary policy. Unfortunately in late 2010 the Riksbank started to fret about house prices. Svensson dissented and went on dissenting until he resigned in disgust last year.